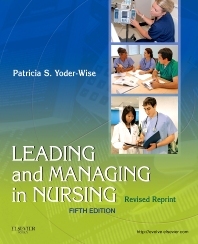 Leading and Managing in Nursing, 5th Edition  Revised Reprint by Patricia Yoder-Wise successfully blends evidence-based guidelines with practical application. This revised reprint has been updated to prepare you for the nursing leadership issues of today and tomorrow, providing just the right amount of information to equip you with the tools you need to succeed on the NCLEX and in practice. Content is organized around the issues that are central to the success of professional nurses in todays constantly changing healthcare environment, including patient safety, workplace violence, consumer relationships, cultural diversity, resource management, and many more. 1. Leading, Managing, and Following UPDATED! 2. Safe Care: The Core of Leading and Managing NEW! 15. Selecting, Developing, and Evaluating Staff UPDATED! 16. Strategic Planning, Goal-Setting, and Marketing UPDATED! 18. Building Teams Through Communication and Partnerships UPDATED! 23. Conflict: The Cutting Edge of Change UPDATED! 30. Thriving for the Future NEW!